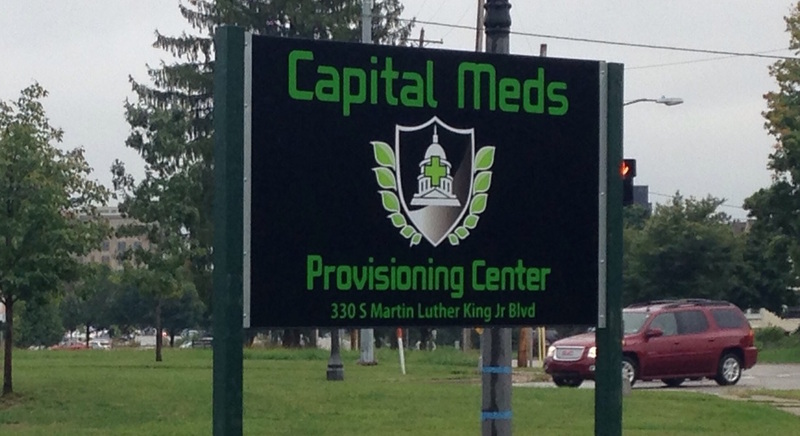 LANSING — In 2015, Robert Mailhot, a care provider from Durand who helps a patient who uses medical marijuana, made his first political contributions. With the Legislature’s effort to safeguard the use of medical marijuana in Michigan then still taking shape, a dispensary owner that Mailhot knows suggested the move, Mailhot said. He ended up attending fundraisers and chipping in $500 each to the chairs of the main committees handling the bills. One contribution went to the campaign of House Judiciary Chair Klint Kesto (R-Commerce Twp.). 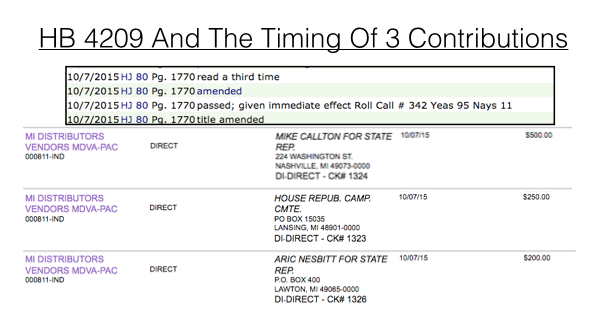 Another went to a political action committee (PAC) controlled by Senate Judiciary Chair Rick Jones (R-Grand Ledge). A review of campaign finance records, corporate disclosures and committee testimony shows that the contributions were far from unusual since the start of 2015. Over that 21-month period, individuals with direct stakes or interests in medical marijuana — some of whom applied for licenses to sell in Detroit earlier this year — have contributed a total of nearly $50,000 to seven key lawmakers working on the bills as they moved through the Legislature. Even more money has been spent on lobbying lawmakers on the matter. After Gov. Rick Snyder signed the bills into law in September, setting up regulations for the growth, transport and sale of medical marijuana, donors disagree over whether money won out. Some say the new system will turn out to be a fair one while others, like Mailhot, are concerned that the new regulations could benefit some specific interest groups, the ones that had the most to spend. In 2008, Michigan voters approved a ballot proposal to allow medical marijuana. However, since then a string of court cases has left those wanting to use medical marijuana facing uncertainty and fear. This legislative session lawmakers took action to try to do something about it, setting up a new system for taxing, regulating, testing and tracking medical marijuana. Under the system, there will be separate licenses for growers, processors, provisioning centers, transporters and safety compliance facilities. Similar to Michigan’s tiered alcohol distribution system, those who are growers and provisioning centers cannot have interests in transporting companies or safety compliance facilities. And transporting companies and safety compliance facilities can’t have interests in other aspects of the industry either. The new laws also enact a 3 percent tax on provisioning centers, allow for licensing fees and implement an annual regulatory assessment. Some of those currently in the medical marijuana business believe that lab testing standards, assessments and taxes will serve as a barrier to keep smaller operations out of future industry growth. Chuck Ream, a long-time marijuana advocate from Ann Arbor, said new requirements around “secure transportation” of medical marijuana would be the “death knell” for small players in the current industry. Of all of the requirements and fees in the laws, he said, “The costs are astounding." At the same time, the business of transporting medical marijuana could be a boon for those who already securely transport other products, like alcohol. 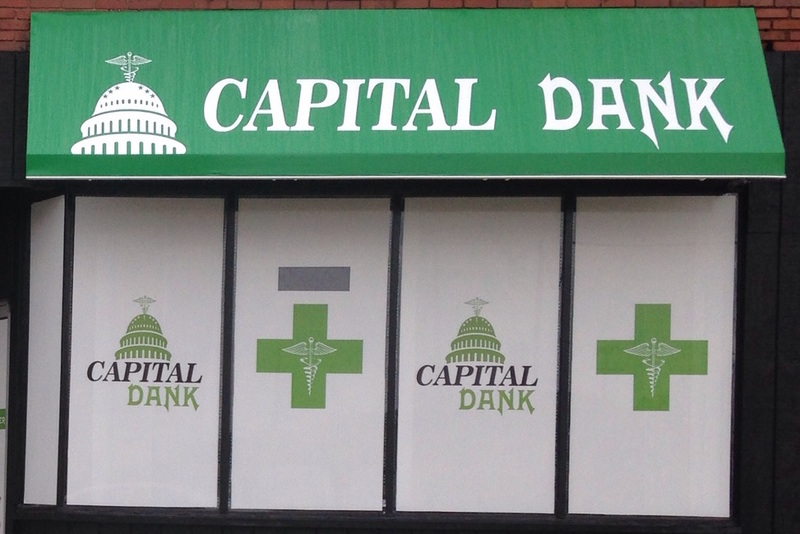 Similarly, some believe tobacco retailers will try to get a piece of the newly shaped medical marijuana market. Most of this, however, is uncertain. The state licenses are yet to be handed out. And Michigan’s lobbying laws make it impossible to determine which groups were talking to lawmakers about which bills as they were crafted. But interest groups connected to the alcohol and tobacco business have sought to influence the new medical marijuana bills. As one example, when the main medical marijuana bill first moved out of the House Judiciary Committee in September 2015, Polly Reber, who identified herself as representing “Michigan tobacco wholesalers,” stated at the meeting that she was in support of the bill, according to the minutes of that meeting. Reber is president of the Michigan Distributors and Vendors Association, which includes tobacco wholesalers. In an interview this week, Reber said licensed tobacco wholesalers already work in a heavily regulated industry, similar to what’s ahead for medical marijuana in Michigan. It’s possible, she said, that tobacco wholesalers could move into the medical marijuana business. “It would certainly make sense,” she added. The Michigan Distributors and Vendors Association PAC made a series of small contributions to lawmakers the same day the main medical marijuana bill first passed out of the House, Oct. 7, 2015, according to campaign finance records. The PAC reported giving — on Oct 7, 2015 — $500 to Rep. Michael Callton (R-Nashville), the sponsor of the main medical marijuana bill, $200 to House Majority Floor Leader Aric Nesbitt (R-Lawton) and $250 to the House Republican Campaign Committee. Reber said the timing of the contributions didn’t have to do with the vote on the medical marijuana bill. The association, she said, writes checks when it has the money available to do so. Those contributions are small compared to others given by individuals currently in the medical marijuana business. One contributor, Nathan Podrid, who has sought to open at least one medical marijuana dispensary in Michigan, gave Jones’ PAC $4,000 on July 30, 2015, according to campaign finance records. That same day, Jones’ PAC took in about $12,500 total from individuals who described themselves as patient care providers. In total, Jones, the chair of the Senate committee that received the medical marijuana bills from the House, has raised $16,750 from individuals clearly interested in medical marijuana policy since the start of 2015. Over the same time period, Kesto, the House Judiciary Committee chair, received $13,950 from individuals interested in medical marijuana policy. Callton, the champion of the bills in the Legislature, received $5,250. Senate Majority Floor Leader Mike Kowall (R-White Lake) received $4,500. Senate Majority Leader Arlan Meekhof (R-West Olive) received $3,950. Senate Minority Leader Jim Ananich (D-Flint) received $1,250. And Rep. Lisa Posthumus Lyons (R-Alto), who sponsored a bill in the packaged, received $1,000. In 2015, Detroit Fox 2’s M.L. Elrick looked into the contributions and the possibility that lawmakers received donations to non-disclosing accounts from those interested in the bills. You can see his report here. Jones’ office didn’t respond to a request for comment this week. One of the donations to Jones came on July 30, 2015, from Mailhot. Mailhot, who also contributed to Kesto, said he gave to the two lawmakers at fundraisers and because they were leading the work on the medical marijuana bills. MCFN talked to a handful of individuals involved in medical marijuana who also made campaign contributions. Many of them said they gave their contributions at fundraisers to which they were invited. Some were disappointed with the outcome of the legislation. Some weren’t. Some didn’t say much at all. “It was part of the fundraiser. That’s all,” said Mark Asmer, who gave $850 to a PAC connected to Senate Majority Leader Arlan Meekhof (R-West Olive). The Michigan Cannabis Development Association is a group of medical marijuana interests that came together to work on the legislation in Michigan. Its spokesperson is Willie Rochon, whose family operates a dispensary in Detroit. The Rochon family gave $500 to Kesto’s PAC and $1,000 to Jones’ PAC in 2015. Rochon said the contributions were made because family members were at fundraisers for the lawmakers. Rochon described the new medical marijuana laws as a “great” outcome. The laws provide stability and regulation for an industry in which many were living in fear because of the uncertain and shaky regulations they were under previously. For instance, Rochon said he’s been through four raids but has never been prosecuted. “(I) feared for my life, every time,” he said of the raids. As for the new regulations and taxes, he said all career paths bring certain standards. For instance, he said his wife had to go to school to become a nurse. Asked if he believes the side with the money won out, Rochon said, no. Michael Lumetta, of M2 Certifications, is also involved with the Michigan Cannabis Development Association. Lumetta’s company helps individuals who need medical marijuana cards get them, he said. Lumetta said he doesn’t believe money played a role in the legislation. And the fact that there’s a license option for small growers in the new laws should ensure that anyone who wants to start a business can do it. Lumetta made contributions to Jones ($1,000), Kesto ($1,000) and Meekhof ($850). The Michigan Cannabis Development Association has worked with the state’s largest multi-client lobbying firm Governmental Consultant Services Inc. Since the start of 2015, the association has reported $77,014 in lobbying spending. Another key group that worked on the legislation was the National Patients Rights Association (NPRA). That group employed the firm McKinney and Associates for its lobbying. Since the start of 2015, NPRA has spent $28,958 on lobbying. A variety of law enforcement groups have had heavy influence on the marijuana bills as well. The Michigan Sheriffs’ Association, the Prosecuting Attorneys Association of Michigan and the Michigan Association of Chiefs of Police have all weighed in on the bills. Since the start of 2015, those three groups have spent $113,878 on lobbying. Even those involved in the negotiations about the bills say it’s hard to know who was pushing for what changes. But there have been many theories out there. Others involved in the legislation didn’t want to say anything publicly because they don’t want to risk their chances at a license and thus, their business later on. Ream argues that the bills are tilted to law enforcement’s interests and “big players” who will be active in the new industry. And he believes the regulations will lead to more black market activity.